Eternal life is not an article of faith but a law of the universe as true as any law of physics. Subject: Eternal life is not an article of faith but a law of the universe as true as any law of physics. One of the world's largest relief efforts is under way to help the millions of victims of the Asia quake, which killed more than 50,000 people. International disaster assessment teams have fanned out to the affected countries and local agencies are distributing emergency aid. The UN says it faces an unprecedented challenge in co-ordinating distribution of aid to some 10 nations at one time. A huge undersea quake triggered sea surges, leaving millions homeless. The disaster zone is now threatened with outbreaks of disease, which the UN health agency has warned could double the death toll. Sri Lanka, Indonesia, India and Thailand were among the worst hit by Sunday's 9.0 magnitude earthquake, which sent huge waves from Malaysia to Africa. The bodies of more than 700 mainly foreign tourists have been found in the Thai resort of Khao Lak - the government says the death toll in Thailand may rise to about 2,000. UN emergency relief co-ordinator Jan Egeland said on Tuesday said the organisation would probably make its largest ever appeal for humanitarian funding. He told the BBC that the damage was "beyond comprehension". "A tsunami of this size happens once in a generation only," he said. "The first wave of destruction has caused tens of thousands of deaths, but the second wave of misery is really caused now by the water and sanitation systems." 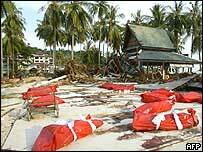 In Geneva, World Health Organization (WHO) expert David Nabarro told reporters "there is certainly a chance that we could have as many dying from communicable diseases as from the tsunami". In Sri Lanka alone, more than one million people are displaced and aid workers are under pressure to ensure they have clean water and sanitation to prevent an outbreak of disease. The local UN agency has opened up its relief stockpiles, but the BBC's Roland Buerk says there is little sign as yet of aid supplies in the south-west town of Galle. People in both Sri Lanka and in Indonesia have been scrambling through mud and ruins looking for food and water, correspondents report. Mr Egeland said hundreds of planes carrying emergency aid would be airborne over the next couple of days. Flights carrying emergency supplies from nine countries, including Britain, France and the US, were due to arrive in Sri Lanka on Tuesday. Coastal communities across South Asia - and more than 4,000 km away in Africa - were swept away and homes engulfed by waves up to 10m high after the quake created a tsunami that sped across the ocean. Many of the victims had no warning. Fishermen were swept off boats, and tourists were washed from the beaches. Sunday's tremor - the fourth strongest since 1900 - had a particularly widespread effect because it seems to have taken place just below the surface of the ocean, analysts say. Tsunamis generated by earthquakes can travel at up to 500km/h. > Wishing all a Happy New Year, notwithstanding the great tsunami tragedy in Asia that reminds us to transcend life's samsara. Some words in which hope may be found at a time of devastating bereavement for many thousands of people, following the tragedy of the Asia Tsunami. Life is a passage, and we need not fear death. Faith and hope will help overcome suffering and loss.